Adventure Companions: Mr and Mrs Proff, Mini Monkey, Giant Baby and the Hike it Baby crew. Do I need to bring some rocks? Here is another ‘get your kids out doors’ craze – rock hunting. As in, hunting for painted rocks that are dropped off/hidden by other rock hunters. I had long wanted to do this but didn’t know where any rocks were being dropped. In order to make it worthwhile, Mrs Proff and I painted up a batch of rocks, stuck a bunch of googly eyes on them and dropped them off 5 minutes before our Hike it Baby rock hunt. I was slightly concerned that all it would take would be one curious family setting off mere minutes before us and all the rocks would be gone before we could get back to them. Thankfully, no such family eventuated and off we went. The venue I chose was Jollimont Lake. It has a very small lake to go around, which, in the direction we went in, led us to the playground at the end. The lake has a couple of easy to access viewing platforms and lots of ducks. 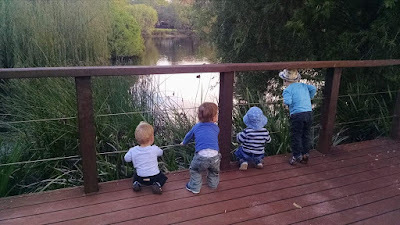 The age range in our little group was from about 15 months to 3 years so there was varying degrees of walking abilities, understanding of the game and satisfaction got by finding the rocks. All in all, it was a fun little exercise and as I still have plenty of rocks left over, maybe I’ll do a random rock drop* for the hunters from WA Rocks. I’m sure that Mini Monkey would love to help distribute them. *Hike it Baby promotes the ‘leave no trace’ principle and has discussed the leaving of painted rocks for others to find in much detail. The position which many of us have settled upon is that it is OK to leave your rocks in urban settings where they are likely to be found by other children i.e. on park benches and in playgrounds, but avoid taking them into lesser traveled areas like bush tracks.